Joyful Expectation, Peaceful Inspiration! 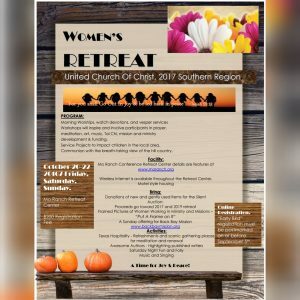 is the theme for the upcoming Oct 20-22, 2017, UCC Southern Region Women’s Retreat/Conference at Mo Ranch in Hunt, TX. 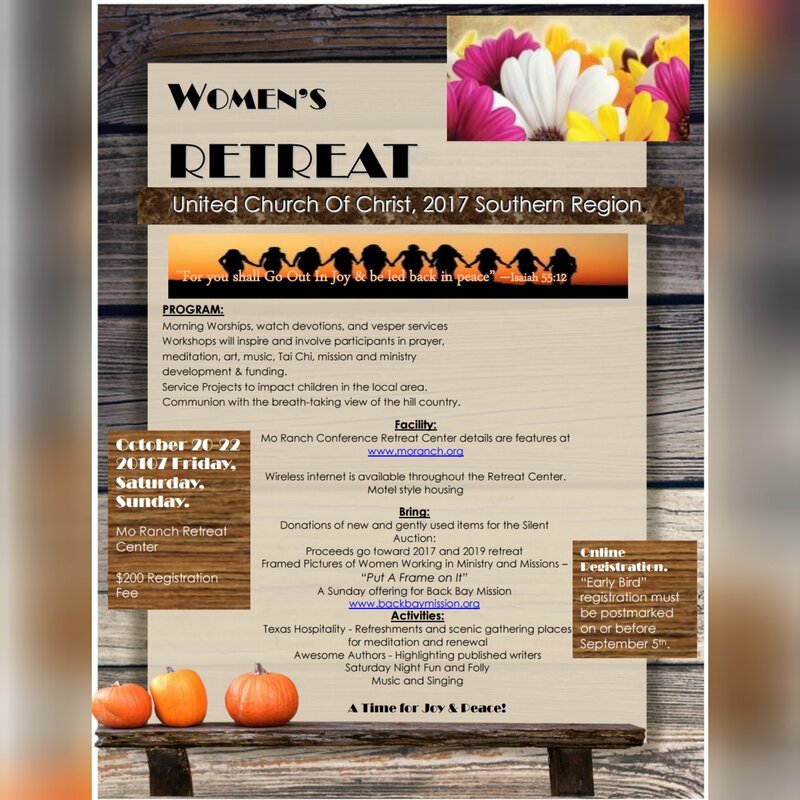 Women from four UCC Conferences (Southern, Florida, South Central and Southeast) are invited. If you are wondering who comes up with the program ideas and who does the planning and organizing, check out the “Planner Bios” below. More information will be released in a timely fashion about leaders, program details and registration information. If you have 2017 SRW questions contact Mary Ruth, Representating Women of Southeast Conference, at [email protected]. Charlotte Albert has been a passionate and dedicated member of the UCC for over 50 years, 37 of those at St. Peter’s Church of Coupland, TX. She is a licensed minister and has been active in the wider church serving the Brazos Association now the Heart of Texas Association, South Central Conference and UCC National on various committees and boards. She loves mission work, women’s issues, justice issues and Christian Education. Her favorite job is being “grannie” to 4 grandchildren and following them around in sports and academic activities! Karen Cotton is a Member in Discernment in the UCC, exploring a second-career call to ministry. She is an active member of The United Christian Church of Austin, an ecumenical partnership between the United Church of Christ and the Christian Church (Disciples of Christ). She was a member of United Methodist and Presbyterian (USA) churches before returning to the UCC a few years ago. Her first career was as an elementary school teacher. She then spent many years volunteering and serving in leadership positions in church, school, community and non-profit agencies while raising two sons. Now, as a seminary graduate with a retired spouse and an ever-increasing number of grandchildren, Karen continues to learn about and participate in a range of social justice and faith issues. Betty Griffin has been a member of the UCC for 36 years. She grew up a Presbyterian in Miami, FL and joined the UCC while attending Elon College in North Carolina. She earned degrees in Accounting and Music and works as a Corporate Accounting Manager. In 2011, Betty was honored as Layperson of the Year for the ENC Association. She is currently President of the Church Women of the Southern Conference and serves on the Southern Conference Board of Directors. Betty loves singing in the Elon Community Church UCC choir, the Women’s Fellowship, travelling and spending time with her family. Carolyn Haverland has been a member of the UCC at St Peter’s Church in Coupland, Texas for 30+ years. 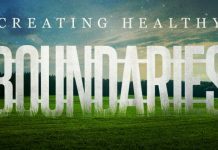 She is active on her Church Master Planning and Board of Christian Education committees. She currently works in the dental field and keeps busy with her family, church and her dachshunds. Pam Mayo graduated from Sam Houston State University with a Bachelor’s Degree in Art Education. She retired after 25 years of teaching ART in the Cypress-Fairbanks Independent School District. 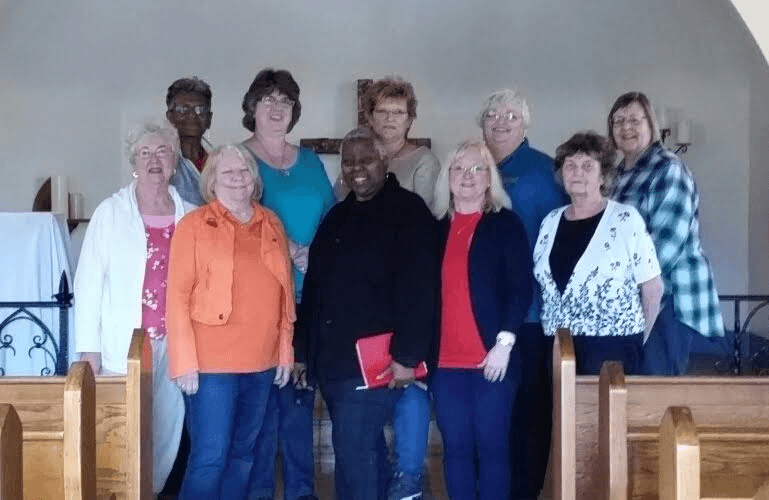 She is a life-long member of Immanuel UCC in Spring, Texas and serves on the Consistory, Evangelism Committee, and volunteers at the church’s Senior Day mission. Pam serves as the SCC Office Administrator. She also organized and led Women’s retreats and accompanied youth on Mission trips. Bert Perry is an active member of New Hope UCC in DeLand, FL. She has served on the Florida Conference of the United Church of Christ Board of Directors, UCC Justice and Witness Network, the Florida UCC Women’s Board as Social Concerns Chair and the Church Women United Board. She was on staff for the National Farm Worker Ministry for 30 years, has been a Church World Service Disaster Consultant, a Board and founding member of Florida Impact, and is a board member of the American Civil Liberties Union of Volusia/Flagler County. She remains active in farm worker actions and issues, in addition to other local and state justice issues. She was an Honored Laywoman at General Synod of the United Church of Christ in 1991, UCC Woman of the Year 2001, Church Women United Valiant Woman 2005, and CWU Human Rights Award Recipient in 2006 and 2009. Rev. Jasmine Quinerly is the Houston Association Minister and Minister of Mission at Pilgrim Congregational United Church of Christ. She is passionate about Back Bay Mission where she serves on the Board of Directors, and regularly leads work camps. Mother of 2; Verrene and Reggie, and grandmother of Harper Joy. Mary Ruth is a life-long UCC layperson and a current member of Southeast Conference Pleasant Hill Community Church in TN. 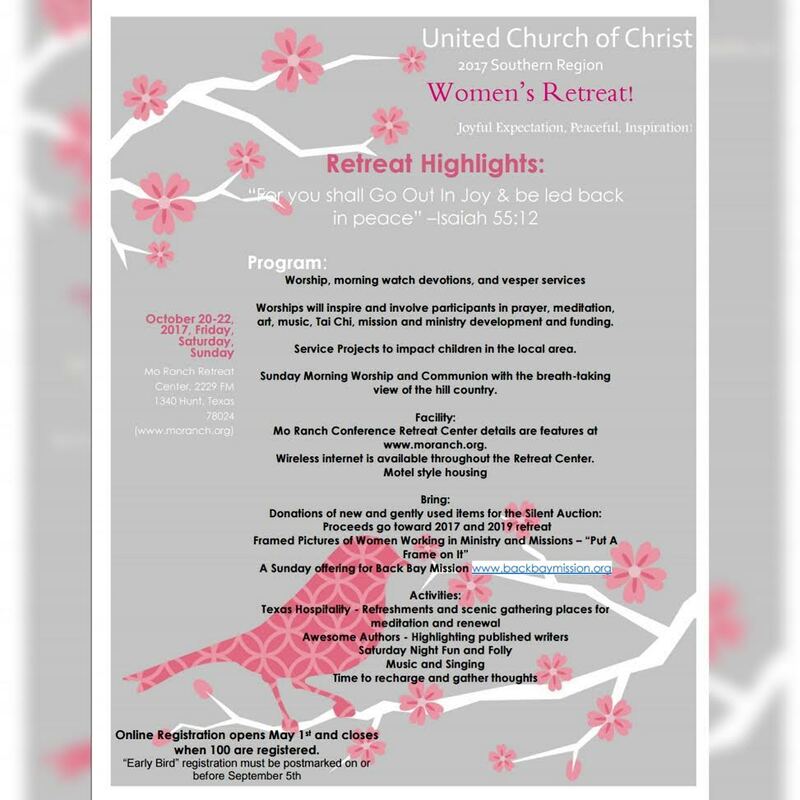 She coordinated the 2015 UCC Southern Region Women’s retreat held in Alabama. Since 2003 Mary and her husband, Bill, have dedicated much of their retirement to the UCC Volunteer Ministries “Partners in Service” program. At General Synod in 2007 Mary and Bill were formally recognized for their “commitment to service.” They reside at Uplands Village where Mary is the team leader for volunteers in the Eden Alternative method of continuing care at the retirement community. Yvette Wilson Scales of the South Central Conference is a member of Pilgrim Congregational UCC in Houston, Texas. Yvette has a long list of local church activities, many involving children, youth and women. She is a past moderator of the Houston Association, co-chair of the conference Faith Works, is involved in her association’s non-profit housing for moderate to low income individuals as chair of the Board of a Trustees of Settegast Heights Village Apartments and board member of United Campus Ministry of Houston. She also served as past president of Texas Southern University National Alumni Association and recently honored as an outstanding alumnus. 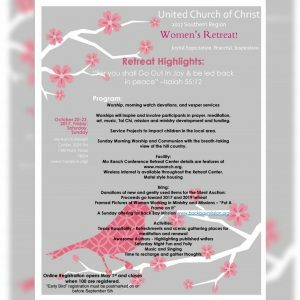 She serves as secretary of Church Women United-Houston. Yvette was celebrated at the 28th General Synod (July 2011) as an Honored Laywoman. She enjoys the outdoors, reading, photography, puzzles, Sudoku and spending time with family. Ann Stockert is a member of Central Congregational Church in Dallas, TX. where she serves as Finance Coordinator, is active in the music and worship ministry and is President of Women’s Fellowship. She is a member of the Executive committee of the North Texas Association. She is a past president of Omaha Church Women United. Attended several General Synods and was Treasurer of G/S 17 held in Fort Worth, TX. She is past president and treasurer of the South Central Conference. She serves on the Conference Committee for New and Renewing Churches and the Constitution and bylaws committee. Ann was chosen as an Honored Lay Woman from SCC celebrated by the National UCC. Her favorite service project is making 150 school kits for Church World Service, a project of SCC annual meeting, each year so that children around the world have school supplies to learn and to express themselves. Marie Weatherspoon is a member of Central St. Matthew UCC (CSM) in New Orleans, Louisiana. Marie presently serves on CSM’s governing board, previously serving as congregation president. Marie is a South Central Conference board member representing the New Orleans Association. She has also served on the Back Bay Mission board. 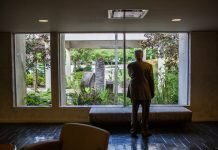 A United Church of Christ member for 60+ years.